The coastline of Ardara and its hinterland has long since supplied the raw ingredients for a world-class cuisine – icy northern waters yielding fresh fish and shellfish, lush green grass for prime cattle rearing, hillside wild herbs for free-ranging lambs, and traditional skills such as butchering, bread making, and our ancient preservation methods of salting smoking & curing. A widespread gourmet food movement has got under way in the last few years as local bars earned international acclaim and coveted awards, revealing the culinary potential and generating enthusiasm. The result is a pervasive emphasis on quality local ingredients and artisan producers. The local Oysters from both Leaconnel and Gweebarra are from the cleanest and clearest waters in Europe. Wild Rosbeg or Portnoo crab, dressed in its shell or just the amazing fresh crab toes in Melted garlic butter. The local bays have long been famous for the freshest lobster in Europe, and are exported to the amazing European markets such as Rengais. Salmon has been eaten in Ireland since prehistoric times and ties into Celtic mythology—the Salmon of Knowledge was considered the wisest of creatures. Smokehouses in Killybegs smoke salmon with oak, beech, or turf, and restaurants such as Charlie’s typically serve it as an appetizer with brown bread. The West End café also serves the best Fish ‘n’ Chips in Ireland according to Georgina Campbell! Fresh oysters available all year at the world-renowned Nancy’s Bar, and when there you have to try Charlie’s Supper, a sublime elixir of smoked salmon and prawns. Standing proudly in the centre of Ardara is The Nesbitt Arms Hotel. Here you can find some amazing options on their menus to satisfy every discerning palate. Fresh Donegal fish adorns their menu daily. 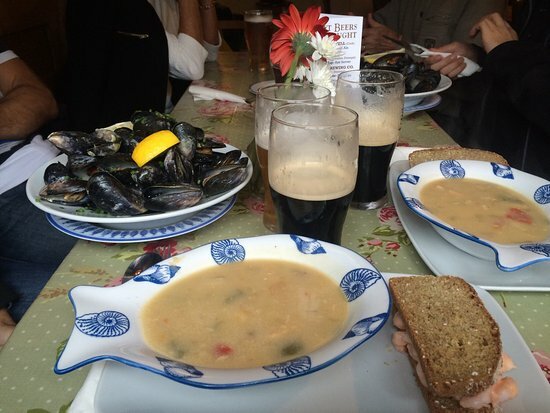 If you desire something smaller, their Donegal Bay Seafood Chowder with homemade brown bread really is superb. Heading up a highly revered kitchen at The Nesbitt Arms Hotel is talented Head Chef Francis Floyd who brings a unique flavour of his own style of modern Irish cooking to the table. Passionate about his food and presentation, Francis sources all produce locally where possible to produce tasty dishes at affordable prices. Healthy options are also available while vegetarians can enjoy varied and creative choices too. All this mouth watering food can be washed down with local craft beers and of course all wrapped up with exceptional service from our warm, friendly Donegal home grown team. The Nesbitt Arms Hotel boasts a unique feature in that all their team are from the area and are always keen to share their knowledge of the locality with their guests. Local food, local knowledge, this little gem in Donegal’s crown will leave a great taste in your mouth. The Nesbitt Arms Hotel ….as unique as Donegal itself….. The menu is delicious; it’s a “no fuss” approach to serving some of the locality’s tastiest and freshest food available. Focusing on seafood including oysters, mussels and smoked salmon, though the menu also caters for other tastes. Food is served 12-9 daily, March – October. From Dawros Bay House you can watch the local fishing boats land the world-famous Atlantic Lobster & Crab. Try grilled 1/2 lobster with garlic butter and fresh salad with homemade chips. Dawros Bay House has a creative take on Donegal lamb, presenting roast loin and braised breast with confit aubergine and rosemary puree, morel jus, and smoked garlic foam. Located in the local Heritage Center, Sheila’s is the perfect place to catch up with old friends and sample some of the finest home baking the country has to offer. They also have a great selection of starters and main courses to satisfy anyone looking for a more substantial meal, but you better leave room for some of their fantastic homemade desserts. during the summer months Sheila’s has extended opening times to provide an evening set menu for the later travelers. Have the Baked Mussels in garlic bread crumbs in the Historical Woodhill House, absolutely devine ,followed with Local wild salmon simply grilled with Local New Potatoes. All in all this amazing area is becoming a destination for an exceptional food experience. Keep an eye out on the site for exciting new gastronomical delights using the very best of local produce provided by the rising army of talented local chefs.!! !